Many people don’t know that toothpaste is too abrasive for most removable oral appliances. Dentures, Mouth Guards and Retainers, for example, are softer than teeth so regular toothpaste will damage the appliances and actually make them less clean. Though the scratches are microscopic, there will be a visible difference in shine and color and the appliance will become a breeding ground for bacteria. This is why you should only use a soft brush and never use toothpaste on a denture. For a detailed explanation of the best way to safely clean and care for specific oral appliances, please visit our Cleaning Tips page. These recommendations have been developed by Lorin Berland, DDS after over 35 years of treating and listening to patients with oral appliances. Failure to keep appliances clean can turn an initially positive experience with oral appliances into negative over time. Even for those who clean their appliance daily, if they don’t follow the correct protocol then they could still be exposed to a range of diseases and discomfort. Clinical research consistently finds that the majority of oral appliances, and their owners, will become infected with Candida Albicans, Streptococcus, Staphylococcus and Actinomyces over time. These common pathogens are the leading causes of Oral Thrush, Denture Stomatitis, Pneumonia and are linked to multiple systemic health issues. Conditions like Diabetes and Dry Mouth can greatly increase the risk of these infections. Without an effective oral hygiene routine, millions of people in the US currently suffer from long term, chronic infections. More tragic, because these people don’t know that they are infected, they gradually become accustomed to the symptoms – redness, discomfort, loss of taste, respiratory and digestive problems – until these symptoms become the “new” normal. The problems associated with removable oral appliances are even greater for denture wearers. The likelihood of developing oral infections increases exponentially with advanced age, tobacco use, alcohol intake, and chronic diseases like Diabetes, Lupus, and Sjogren’s. Certain medications exacerbate these problems by upsetting the normal balance of oral flora, disrupting saliva formulation, and result in Dry Mouth. To make matters even worse, Dry Mouth negatively impacts denture retention. From Dr. Berland’s 40+ years of experience, both as a denture technician and as a dentist, the best time to introduce a proper oral appliance hygiene routine is at the beginning. Waiting until a patient is already infected, and treating the issue with antibiotics, has a range of consequences – the removal of good bacteria and increasing drug-resistance of the pathogens – while not eliminating the cause of the infection. Typically, if denture patients develop problems after the treatment, they tend to go to a drugstore, not a dentist. Unfortunately, neither the denture wearer nor the pharmacist can identify the problem, and the underlying causes of infection – the bacterial and fungal colonies in the biofilm on the dentures and gums – are left untreated so the patient continues to suffer from the same recurring infections. That’s why the best solution for oral infections is prevention, which is easily accomplished by directly disinfecting the oral appliance and removing biofilm with a powerful soak cleanser, like Cleanadent Crystals in a Sonic Cleaner, as part of a daily oral hygiene routine. Even though the number of people with oral appliances keeps growing, there is little practical information about the proper care of specific devices and edentulous gums. That is why Dr. B Dental Solutions is dedicated to educating the public about oral appliance hygiene, and developing products that help improve the lives of people with oral appliances..
Candida Albicans is the leading cause of Oral thrush, Cheilitis and Oral Stomatitis. Candida Albicans is a fungal yeast infection of the mouth that is a major cause of a range of illnesses and health issues. Candida is known for its resistance to antibiotics and clinical research has found that without proper cleaning, almost all removable oral appliances will eventually become infected over time. Certain mouth infections can be related to dentures and Candida can have many manifestations. Oral thrush — also called oral candidiasis is a condition in which the fungus Candida albicans accumulates on the lining of your mouth. Oral thrush causes creamy white lesions, usually on your tongue or inner cheeks. Sometimes oral thrush may spread to the roof of your mouth, your gums or tonsils, or the back of your throat. Oral or Denture Stomatitis is caused by a Candida overgrowth in the mouth. common condition where mild inflammation and redness of the oral mucous membrane occurs beneath a denture. The symptoms of denture-induced stomatitis are subtle. The symptoms are small red bumps on the roof of the mouth &/or a general redness in the mouth, especially on the palate and ridges under your dentures. This most frequently occurs when dentures are not removed and cleaned regularly. Cheilitis is a painful and unsightly candida/yeast infection that typically causes cracking at the corners of the mouth. Candida can accumulate in old and/or dirty dentures and from there spread to certain areas of the mouth. To prevent these infections, see your dentist regularly to make sure your dentures fit properly. Once you have a well-fitting denture, a strong oral hygiene routine is essential to preventing infections and disease. A highly effective cleansing routine should include a daily soak for 5-20 minutes with a disinfecting cleanser, like Cleanadent Crystals and for best results, with a Sonic Cleaner. To maintain a healthy mouth and gums, brush gently with Cleanadent Paste. This will also prevent discomfort related to Dry Mouth. 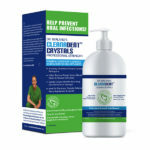 Cleanadent Liquid Crystals is the only soak cleanser to kill Candida, streptococcus, staphylococcus, actinomyces and e. coli. Cleanadent Crystals is the only soak cleanser that kills pathogens like Candida, Strep, Staph and Actinomyces on all removable oral appliances out the use of bleach or chlorine. These pathogens are the leading causes of Oral Thrush, Stomatitis and Pneumonia, and anyone with an oral appliance is at a high risk of infection. Cleanadent Crystals completely eliminate odor, remove heavy stains and disinfect appliances. Ideal for Dentures, Partials, Retainers, Aligners, Sleep Apnea Device, Mouth and Night Guards. Akpan A, Morgan R. Oral candidiasis. Postgraduate Medical Journal. 2002;78(922):455-459. doi:10.1136/pmj.78.922.455. Dr. B Dental Solutions Dallas, TX 75205 Telephone: 1-844-DRB-DENT (372-3368) E-mail: info@drbdentalsolutions.com Copyright © Dr. B Dental Solutions. All rights reserved.